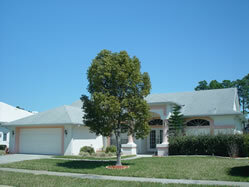 Great vacation villa on the Gulf of Mexico in Hudson for up to 8 persons with private pool and 4 bedrooms 3 bath. Spread out and relax in this spacious four bedroom home. Two bedrooms have their own ensuite bathroom and the third and fourth bedrooms share yet another shower room. Plenty of space to read, relax or sleep in the sun. What about a round of golf ? Just minutes away and at reasonable rates.